armoring of the shore in the short or medium term. It is our understanding that this work was grantsupported. the south, which includes this portion of the island. Sep. 5, 2008, p 2 COASTAL GEOLOGIC SERVICES, INC.
Puget Sound region for the US Army Corps of Engineers and the Puget Sound Nearshore Partnership. historically, with beach sediment bypassing several intertidal sandstone outcrops. increased wave refraction on the down-drift side. northern cell started just north of the Ferry Terminal and ran to the tip of Lane Spit. to the extent that net shore-drift continued around the waterward end of the rock armoring (Photo page). (intertidal) that trends to the north, with sediment staying (Figure 1). in the north end of the study area. The three areas are described briefly below. beach. This eastern area appeared to be at elevations approximately mid-tide level at the toe of the rock. Sep. 5, 2008, p 3 COASTAL GEOLOGIC SERVICES, INC.
this area as covered by Fairbanks Environmental. be quite old. Several creosote treated logs and timbers were also present in this area. The high-tide beach face was composed of sand with moderate amounts of gravel (pebble and granule). beach was the same sand flat discussed above also extending to the sandstone outcrops. included old root wads and a variety of large and small woody debris sizes (See Photo page). and granule. However, larger pebble was present along with isolated boulders. observed crossing the high-tide beach and low-tide terrace during both field visits. The low-tide terrace in this northern beach reach contained far more gravel than the southern beach. Gravel sizes ranged up to pebble and cobble among abundant sand and several isolated boulders. Sep. 5, 2008, p 4 COASTAL GEOLOGIC SERVICES, INC.
measured in the field at 30 to 40 degrees, which agrees with the topographic survey. minor amounts of fine sand and pebble to gravel dropstones. was evident in the silty matrix along with more frequent pebble and gravel dropstones. approximately 4-6 ft above bank toe. 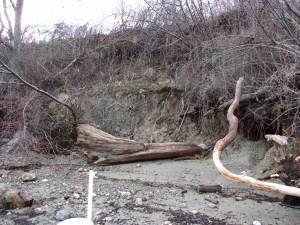 Less seepage was observed at the bank along the southern beach. quantity of rock covering it. Sep. 5, 2008, p 5 COASTAL GEOLOGIC SERVICES, INC.
(Fletcher et al 1997, Dolan Hayden 1983). south. Accretion varied between 2 and 20 ft horizontally in the 27 year period, equivalent to 0.1 to 8 in/yr. during northeasterly winds. This is the area with the wide sandy backshore. Sep. 5, 2008, p 6 COASTAL GEOLOGIC SERVICES, INC.
accelerated sea level rise (Mote et al. 2008, Johannessen and MacLennan 2007, Snover et al. 2005). enhance the stability of beaches (Johannessen 2002, Johannessen 2000). Two shoreline reaches were identified that warranted bank toe erosion protection within the study area. bank. Measurements were made in the field and road shoulder width is also graphically shown in Sheet 1.
reach has experienced extensive bank toe erosion and a number of small slides in the recent past. installation of a bulkhead is not required. and coarser than what is at the site (Sheet 2). Sep. 5, 2008, p 7 COASTAL GEOLOGIC SERVICES, INC.
berm would be limited to approximately 6 ft wide crossshore, from the bank toe waterward (Sheet 2). and cedar are the species that last the longest and these are the only species acceptable for this project. acquired much cheaper than whole logs on land. drift logs and other LWD. Sep. 5, 2008, p 8 COASTAL GEOLOGIC SERVICES, INC.
lower with the deadman anchors. not cross the stream, in order to keep the channel flowing across the upper-most beach. local nursery that specialized in native species (such as Fourth Corner Nursery in Whatcom County). sediment and watered occasionally in the first few dry months. not seem to exist on the island, such that eh ferry or other water transport would be required. used, the total costs may exceed the upper end of the estimate. limited residence time and short term benefit only for potentially increasing forage fish spawning areas. Sep. 5, 2008, p 9 COASTAL GEOLOGIC SERVICES, INC.
enough to offset the trend of erosion that has occurred in the past few decades. cause additional bank erosion and no action is required for this culvert. closed to the present bank face and to allow for a clean attachment area. Environmental, such that no additional recommendations are provided here. and this contact was passed on to Wanda Cucinotta. DNR may be able to assist with this. carried out, such as water quality work for the parking/loading area, as well as other recommendations. Sep. 5, 2008, p 10 COASTAL GEOLOGIC SERVICES, INC.
must be exercised when working on unstable slopes or close to foundations. Geologic Services at (360) 647-1845. Thank you for choosing to work with CGS. Coastal Processes and Erosion, CRC Press, Inc: Boca Raton, FL, p.123-149. Lowland, Washington; Geologic Society of America Bulletin, v. 74, p. 1465-1484. Easterbrook, D.J., 1976, Geologic map of Western Whatcom County, Washington, USGS Map I-854-B. Journal of Coastal Research, vol. 13, no. 1, p. 209-215. Washington Univ., Bellingham, 76 p. 1 map. Shore and Beach, vol. 49, p. 38-42. Proceedings of Puget Sound Research 2001, Bellevue WA, Puget Sound Action Team, Session 4b. component, US Army Corps of Engineers, Published by WA Sea Grant, Seattle WA. Environmental and US Army Corps of Engineers Nearshore Change Analysis - General Investigation. Sep. 5, 2008, p 11 COASTAL GEOLOGIC SERVICES, INC.
and Earth Resources Open File Report 2000-5. Figure 1. Oblique aerial photo of the site, from 2006 by WA Dept. of Ecology. Figure 2. Oblique aerial photo of the site and northern bedrock shore from 2006 WA Dept. of Ecology. Figure 3. Shore change map 1977-2004. Sep. 5, 2008, p 12 COASTAL GEOLOGIC SERVICES, INC. Figure 1. Oblique aerial photo of the site from 2006 WA Dept. of Ecology. Figure 3. Change in log-line and toe of high tide beach between 1977 and 2004. Sep. 5, 2008, p 13 COASTAL GEOLOGIC SERVICES, INC.
Photo Page. Lummi Island Ferry Terminal (top), south beach (middle) and north beach (bottom) on May 5, 2008.